Printing with our full colour textile printer for logos / photos and texts. Quality for company, private, student and association. White print on black shirt? We do! Colors print on black, red or green? Of course! Just a white shirt with print for outing? Of course! You can choose your clothing from our range, take a look at our online designer or ask for the catalogue. Ask for our catalogue for the entire range. What more can we print? Clothing must be able to withstand the pressure and temperature of 180g. No seams etc. at the place of printing. 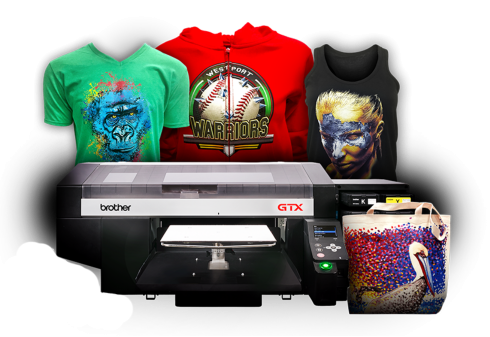 We give no guarantee on clothing supplied by yourselves, so if something becomes unusable as a result of or after printing, only the printing costs will be reimbursed, not the clothing. See also our general terms and conditions, article 16.